Camden residents have a long history of accommodating the legacy of Sherlock Holmes, as the home of Baker Street, the address Conan Doyle gave his illustrious sleuth, Sherlock Holmes. So it’s almost no surprise that residents will be celebrating the new rendition, opening today, with a summer party. Sir Ian McKellen plays Mr Holmes in the film of that name, adapted from the novel A Slight Trick of the Mind. Sherlock Holmes, now old and reflecting on his life, tries to crack an unsolved case. Here’s the trailer. 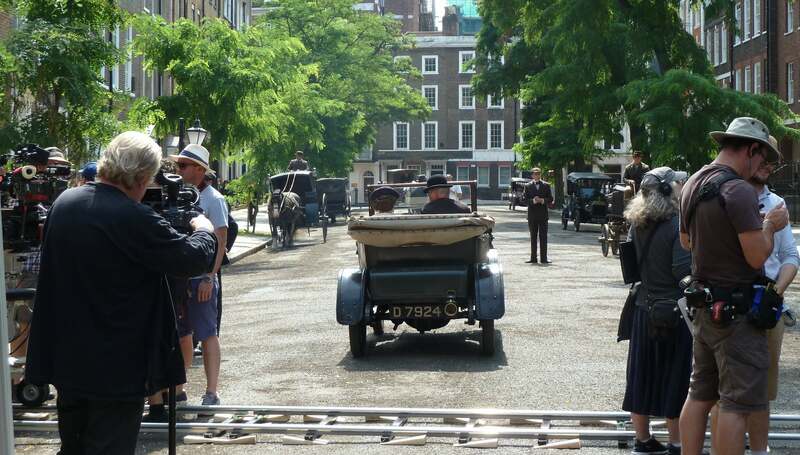 Red Lion Square residents hosted the filming, helping Bloomsbury dress up for the period – 1909. Craig Bryson belongs to the Tenants and Residents Association of Red Lion Square, where filming in the summer last year involved road closure, cranes, and scaffolding. He says, “The most important thing was that we were contacted months ahead of the shoot. We were asked what we thought, we were given maps, the structure going up was explained to us – it was very professional. The filmmakers made a donation to the Tenants and Residents Association, which will be spent on a summer party. “There are six buildings in the square,” Craig says. “And we don’t all know our neighbours. So a summer party for us all is great way to make sure everyone benefits from the donation. Conway Hall on Red Lion Square was transformed into the Pavilion Cinema in Eastbourne. Tresham House on the square, a post-WWII building, had to be covered in period scaffolding to fit in with the look. It’s little wonder that authenticity was insisted upon: production designer Martin Childs won the Oscar for best Art Direction-Set Decoration with Shakespeare in Love. Horses, carriages and vintage cars came in. Yellow lines on the road surfaces had to be concealed. Londoners will spot locations such as Barter Street, where Sherlock Holmes walks along and enters a bookshop. From inside a house in Bedford Row, Sherlock Holmes looks down at a removal van parked outside. On Carey Street, lots of small sequences were filmed of Holmes following a woman he’s investigating, in and out of shops and along alleyways. There was also filming inside Islington’s Farmiloes Building, along with Camden’s Mary Ward House, Craxton Studios (with a donation was made to the local Red Frog residents association) and inside the Dr Williams’s Library on Gordon Square. Residents and filmmakers, rubbing along to put stunning locations on the big screen? Well… it’s elementary.